As you guys know, I love spiralizing veggies. Zucchini, potatoes, onions and cucumbers… I’ll try anything! 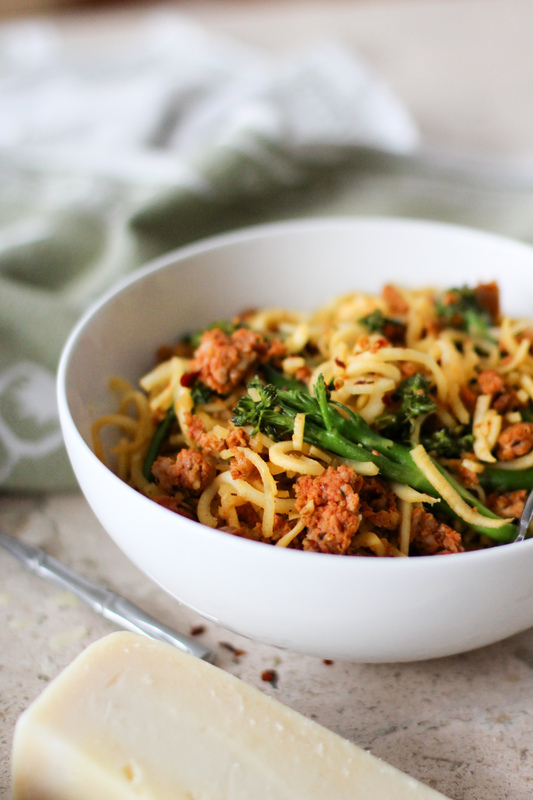 So as a spiral-addict, I am THRILLED to tell you that there is now an ELECTRIC spiralizer! Yup, your obsession just got enabled even more. Good thing it’s healthy, right? ? Once I got my hands on my new BELLA spiralizer, I knew I needed to make something awesome… so I decided to test out some uncharted territory: Parsnips. Let me tell you, this was an excellent choice. Before I get to the recipe, we have to take a little bit more about this handy appliance by BELLA. 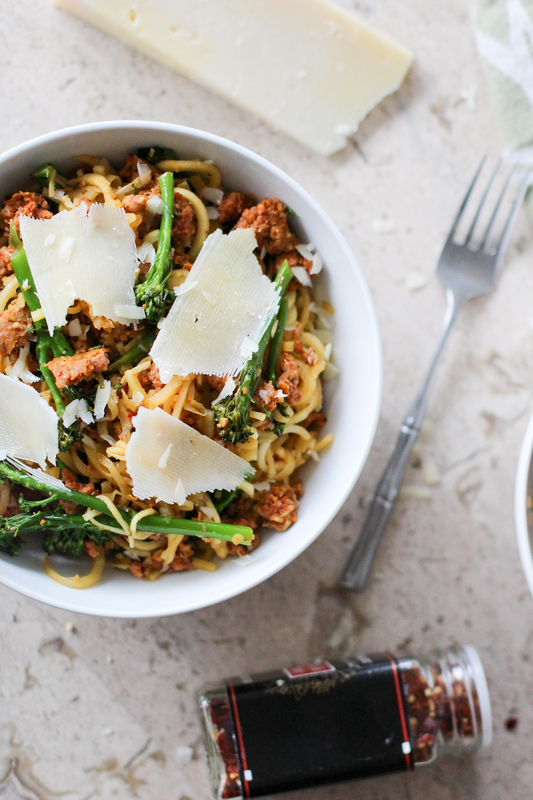 To be honest, I didn’t really mind manually cranking my old spiralizer – until I tried this one. It’s just so EASY. It even automatically stops when it gets close to the base of the veggie! I also love that you can make 4 different shapes: ribbons, linguine, spaghetti and fettuchini. Oh, and the removable parts are dishwasher safe. Wins all around. 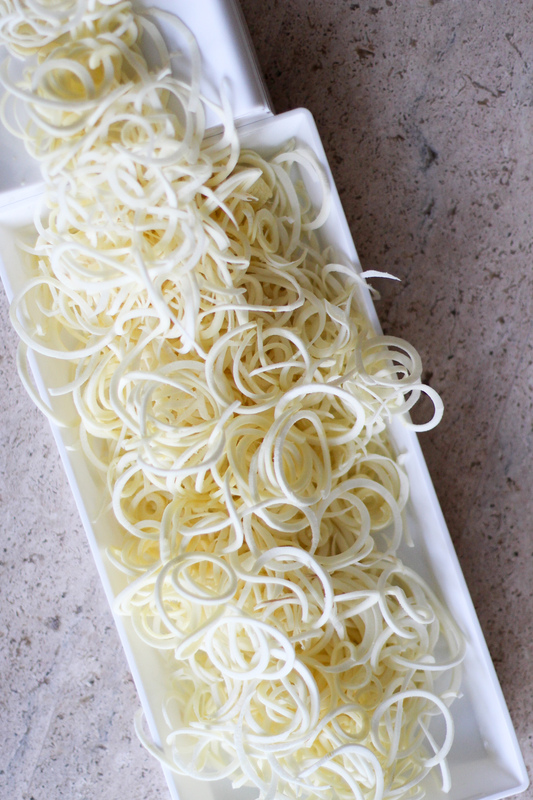 Now that I’ve gushed about the spiralizer, it’s time to talk about spiralized parsnips. Before turning them into noodles, I already thought parsnips were underrated. Cut them into fries, roast em til crispy and dip them in Kite Hill Chive Cream Cheese Style Spread? Soooooo good. 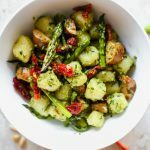 That being said, I still don’t make this veggie that often – and I honestly think it’s because I don’t have a ton of recipes for it! I also thought it might be tough to turn into noodles… but with this handy gadget, that worry is irrelevant. Confession: when I was coming up with this recipe, I didn’t start with parsnips. 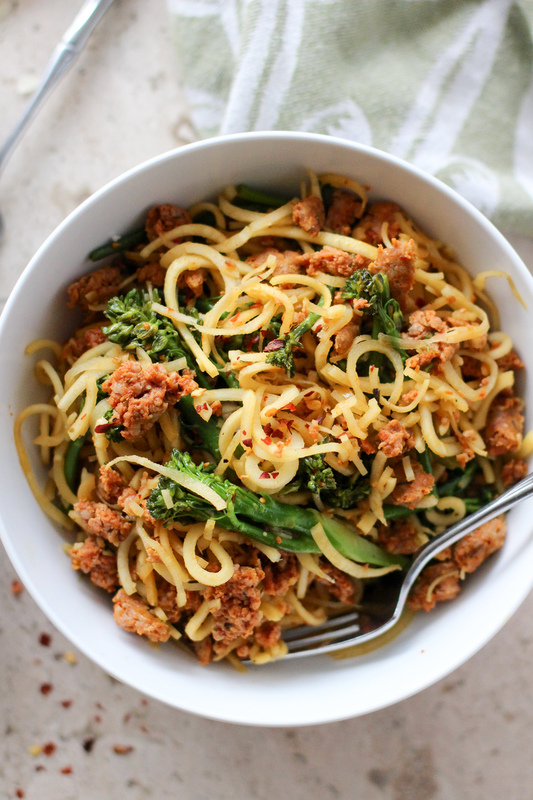 I was thinking about a broccoli rabe and sausage pasta dish first! 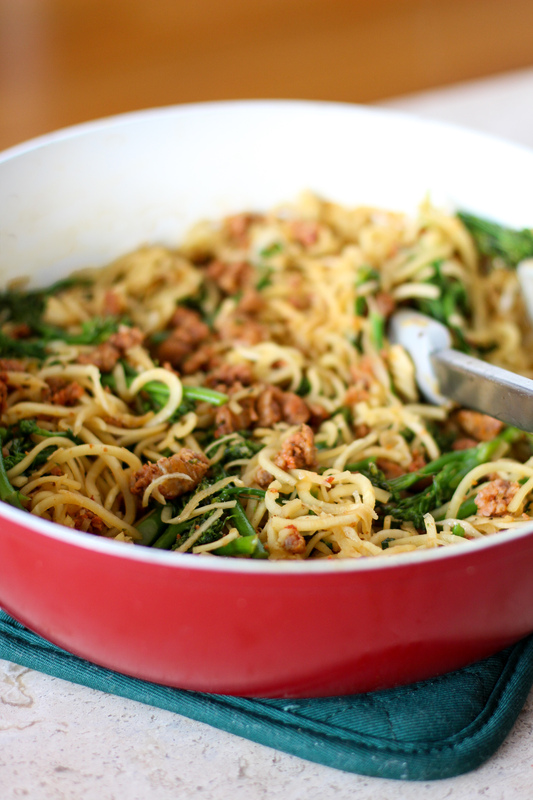 What veggie noodle could work as a substitute? Zucchini noodles definitely wouldn’t work… neither would cucumbers or potatoes… but what about parsnips? Their sweetness would be the perfect balance against spicy sausage. Also, their mild starchiness wouldn’t compete with the broccolini. And parnips and garlic? I already knew that combo was awesome. And thus, this recipe was born! Okay but really, don’t spiralized parsnips make the prettiest noodles?! 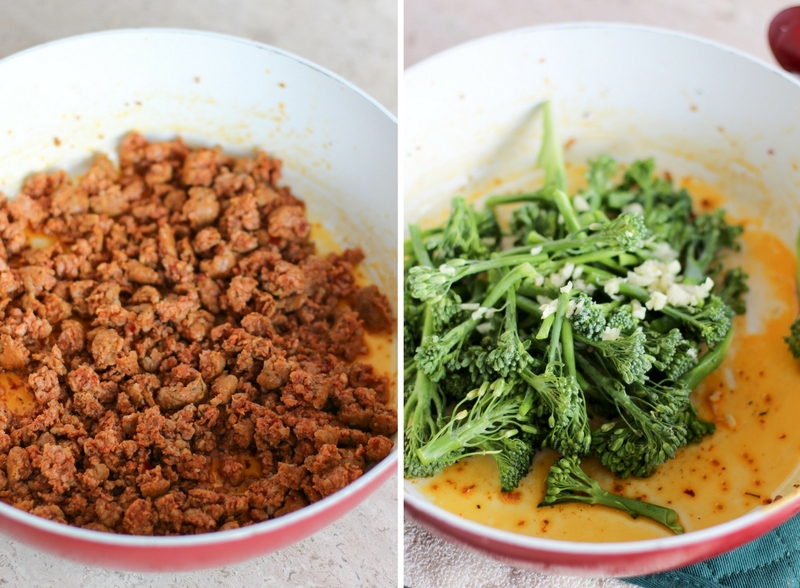 As you read the recipe below, you’ll see that the bowl above is paleo and the bowl below is not. 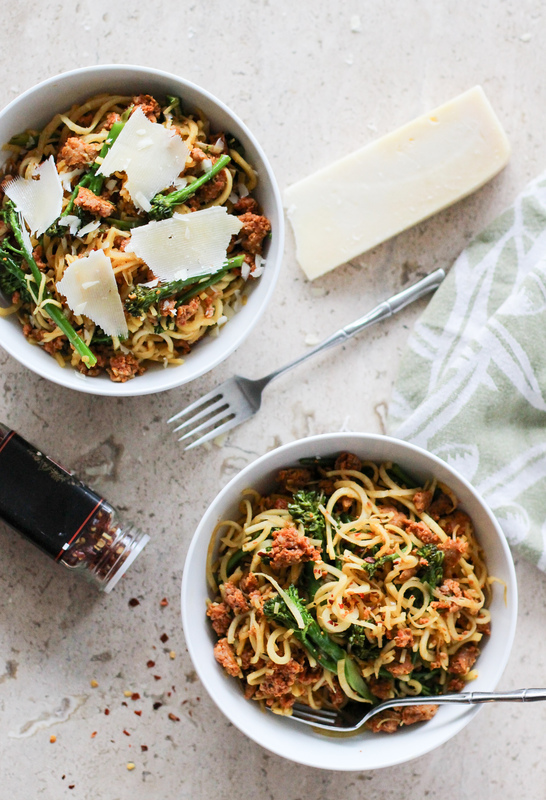 Since this is a riff on a classic Italian dish, I had to add a little parmesan (duh!) but if you’re dairy free or following a paleo diet, just leave it off! Still super delicious, I promise! 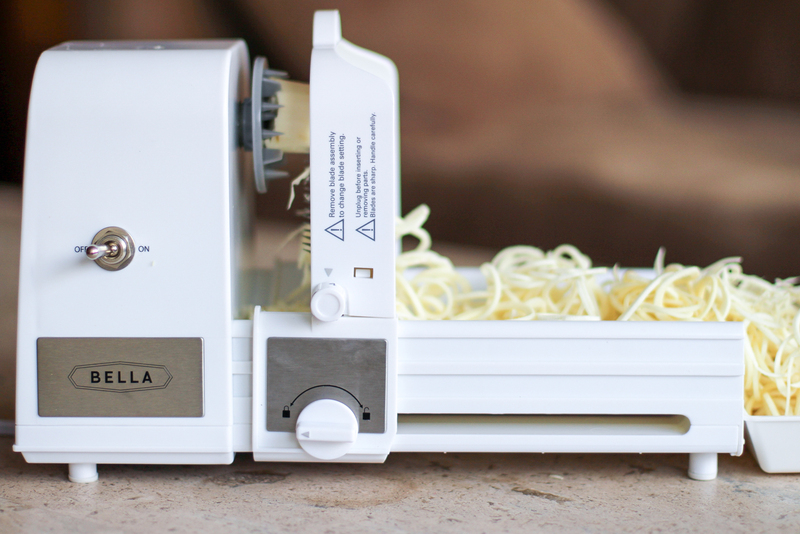 Peel your parsnips and secure in your Bella Spiralizer. Turn it on to make noodles! Set aside. 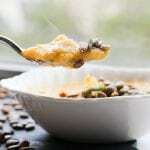 Remove sausage from the casing and add to a hot pan. Break the meat up as it cooks. Once cooked through, remove from the pan. Drain the grease, but don't wipe the bottom of the pan. 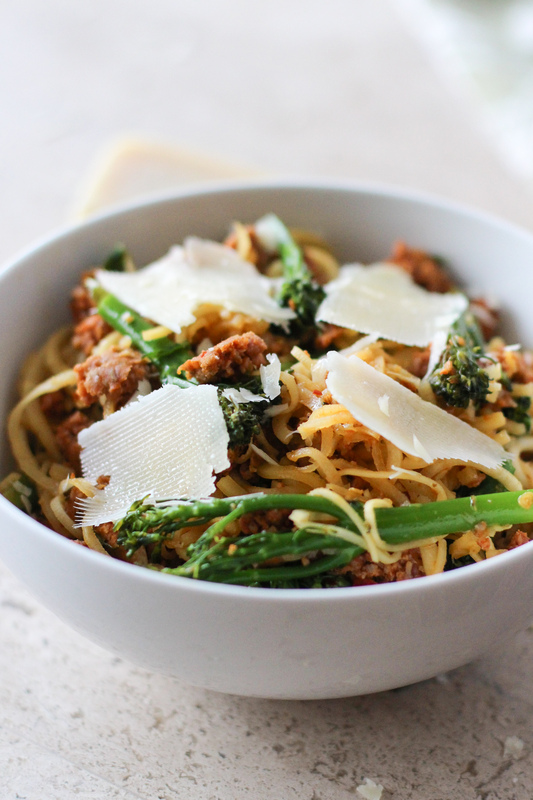 Cut broccolini into bite sized spears and mince garlic. Add to the pan with the little bit of sausage grease. 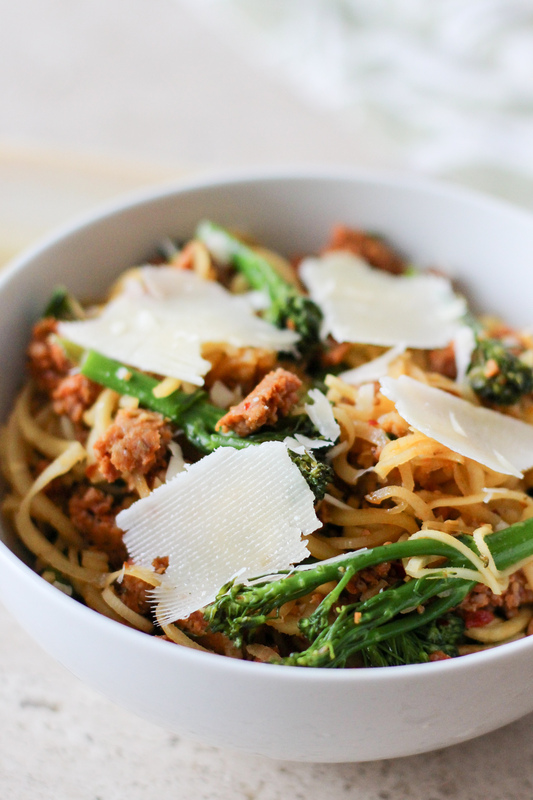 Add 1/4 cup of water and cover the broccolini for 3 minutes over medium heat. Remove the cover and deglaze the pan with 1/2 cup broth, scraping the bottom. 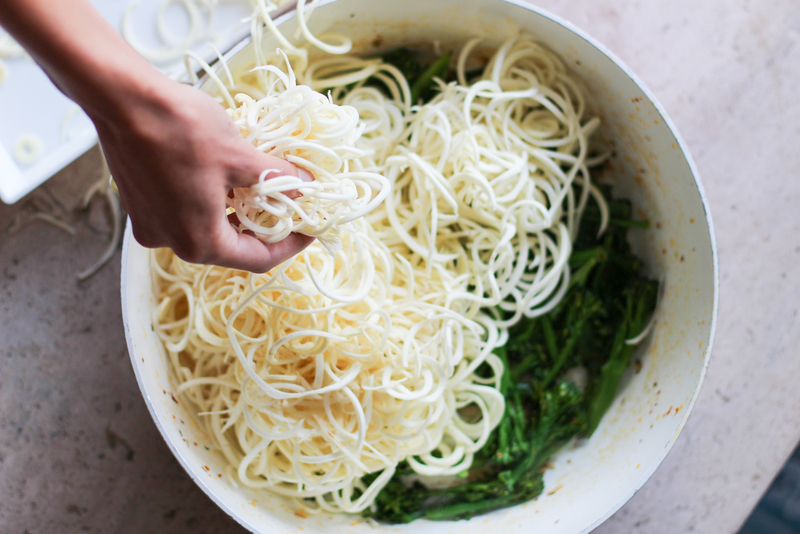 Once the broccolini is fork tender, add the spiralized parsnips. Cover the pan again for 2 minutes. Uncover. Add the sausage back in and toss to combine. Cook for another 3 minutes. Taste your parsnips and cook longer if they're still too firm. PS. 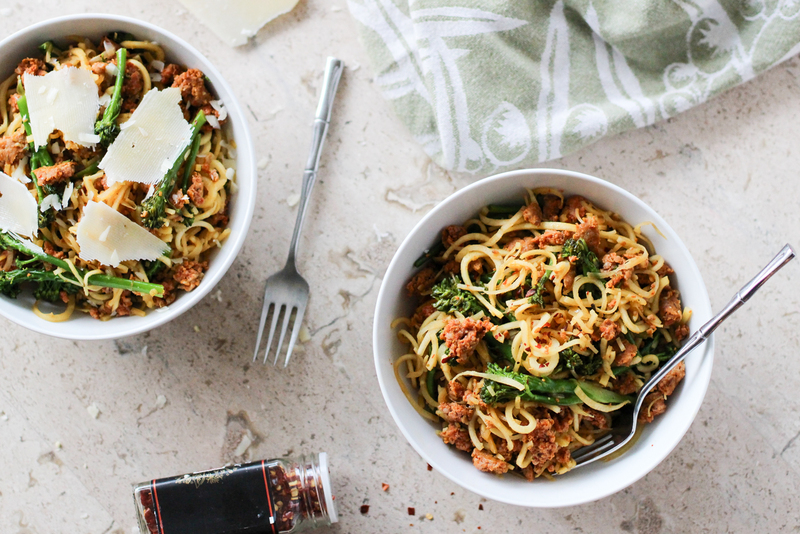 You might also like Zoodles with Turkey Meatballs and Chicken Sausage and Broccoli Pasta. This post was sponsored by BELLA Housewares, but (as always) all opinions are my own. Thank you for supporting the brands that make Lake Shore Lady possible! I’ve never spiralized parsnips either but this recipe looks really good. I think I’d go for mild sausages though!